What are Class D Fires? Almost anything is determined by its ingredients, and fire is no exception. While all fires share their need for oxygen and heat, they vary by fuel. Fuel is an essential component of any fire, and not all fires are the same. One class that notably stands out is Class D, which is comprised of fires that ignite from combustible metals. When most people think of fire, they have a very clear, incinerating image in their heads of red and yellow flames, sometimes with a blue kernel where the flames peak at high temperatures. This is but one type of fire, Class A, which is defined by ignited ordinary combustibles, such as wood, paper, and many plastics. Fires are also often fueled by flammable liquids (Class B) or involve energized electrical equipment (Class C). Less commonly, there’s Class K fires, which involve cooking oils and greases, and they necessitate special considerations. In terms of household and workplace fires, Class A, B, or C fires are relatively common. In fact, many typical fire extinguishers are rated ABC, meaning that they are capable of extinguishing flames that fall under these three categories. In accordance with NFPA 10-2018: Standard For Portable Fire Extinguishers, there are various classifications for fire extinguishers that align with their respective fire types. NFPA 10-2018 calls for fire extinguishers and extinguishing agents for the protection of Class D hazards to be provided in work areas where combustible “metal powders, flakes, shavings, chips, or similarly sized products are generated.” It also states that these extinguishers should be specifically listed and labeled for use on the specific combustible metal hazard. The combustible metals that can set off Class D fires typically include magnesium, titanium, zirconium, sodium, lithium, and potassium. Metals fueled by these fires are especially dangerous, as, even though they need a considerable amount of heat to ignite, their flames can spread quickly. Furthermore, some combustible metals react with water, meaning that trying to put them out with H2O can only accelerate the conflagration. Instead, Class D fires are typically put out by dry powder fire extinguishers, which smother the fire, separating it from oxygen and absorbing the heat contained within it. 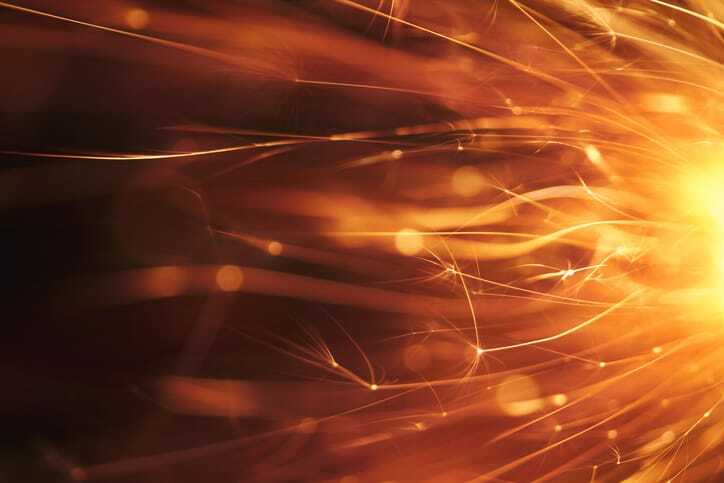 Combustible metal fires are often characterized by their brightness, and magnesium is probably the greatest example of this radiant phenomenon. When magnesium—which has a melting point of 1,202 °F and a boiling point of 2,024 °F—is in its metal form, it burns very easily in air. When burning occurs, magnesium reacts with oxygen to form magnesium oxide. Magnesium oxide is the bright white light seen in these flames. Below is one of many examples of magnesium fire you can find online. However, while it is fascinating, magnesium fires should not be taken lightly, as disastrous incidents associated with them are known to occur. Back in 1988, there was a tractor-trailer explosion in Chicago. This tractor-trailer was filled with 91 percent pure magnesium. Firefighters who arrived at the scene could not extinguish the fire and were left only with the option to prevent the spread of the conflagration. Titanium, unlike most combustible materials, can even burn in nitrogen gas. Titanium fires, for the most part, are a concern associated with friction between various components. Titanium is favored for it high-strength-to-density ratio, temperature resistance, and excellent corrosion behavior. For this purpose, titanium alloys have been widely applied to aircraft structural components and turbine engine parts. In fact, as of 2017, about 80 percent of all US titanium was used in aerospace construction. In aero-engines, titanium fire can occur in the fan and compressor. These fire events are typically short—rarely lasting longer than twenty seconds—but they can reach temperatures as high as 5972°F, destroying surrounding materials. Back here on the ground, titanium fires pose serious threats, as well; notably, plants processing titanium for consumer products, such as paint, are subject to titanium explosions. In January 4, 2019, an explosion injured three people at a titanium plant in Michigan. The video below demonstrates a titanium fire. While magnesium and titanium are the two primary fuels for Class D fires, there are several other known combustible metals. Several videos below demonstrate the appearance of their flames. Other than fire extinguishers, which are addressed in NFPA 10, standards keep safe numerous professionals from the hazards brought forth from combustible metals. NFPA 484 offers a lot of general guidance, as it is the standard for combustible metals, and NFPA 652 deals with combustible dust. From ASTM International, there’s ASTM E1515-14 and ASTM E1515-14 for testing combustible dusts.